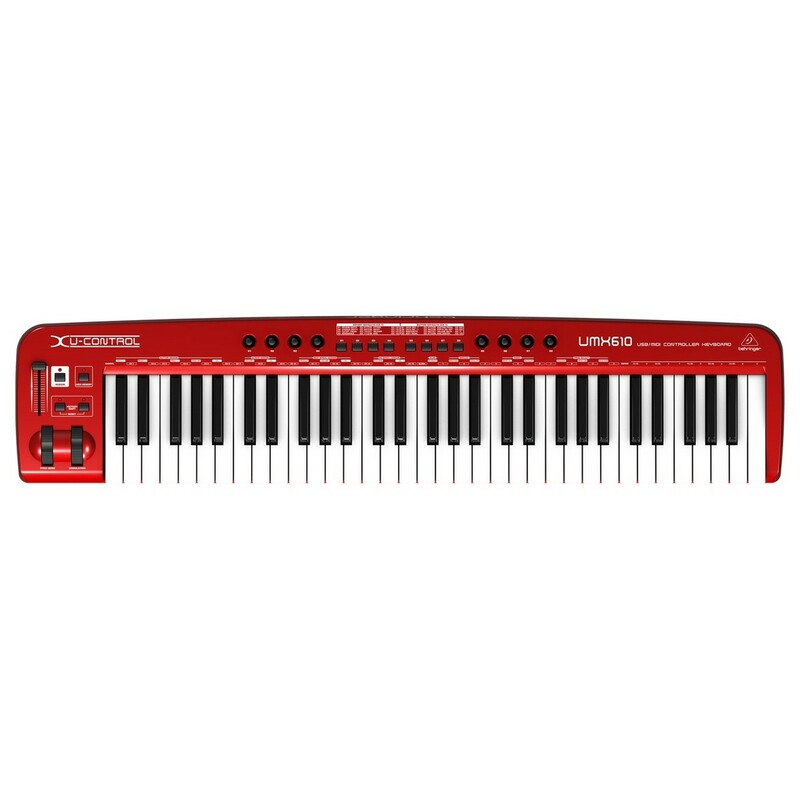 The Behringer UMX610 MIDI Keyboard is a 61-key USB/MIDI controller keyboard complete with a separate USB/Audio interface. This highly versatile MIDI keyboard is the ideal choice for any digital musician, allowing you to control a range of virtual instruments and components within your DAW. The 61-note keybed features velocity-sensitive keys for added responsiveness, allowing you to utilise dynamic changes like a true pianist. The UMX610 also features an assignable modulation wheel, volume fader and pedal port. Additionally the keyboard comes complete with a USB/Audio interface and free audio recording and editing software to get you started straight away. 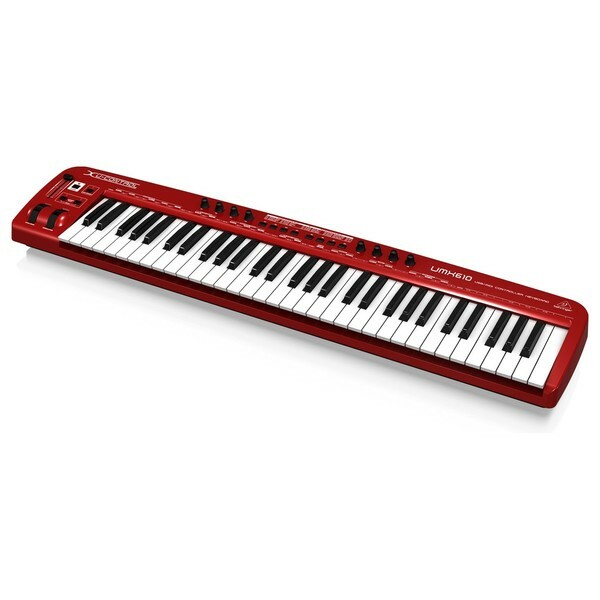 The Behringer UMX610 MIDI Keyboard features a 61-note keybed with velocity sensitive keys with both USB and MIDI connections. Its plug and play functionality means you can quickly and easily get your keyboard setup within minutes. This eliminates the needs additional drivers and tedious setup parameters, allowing you to get setup and playing in no time. The velocity sensitive keybed makes for a quality playing experience adding to the keyboards overall responsiveness. The velocity sensitive keys adds to its performance value, allowing you to input notes like a true pianist, making way for dynamic changes and more. The Behringer UMX610 also features a volume fader, modulation wheel and pitch bend wheel for added versatility, allowing you to manipulate and change sounds on the fly. The keyboard will run via the USB connection without the need for an external power supply but can also be used with batteries or a power adapter (not included). 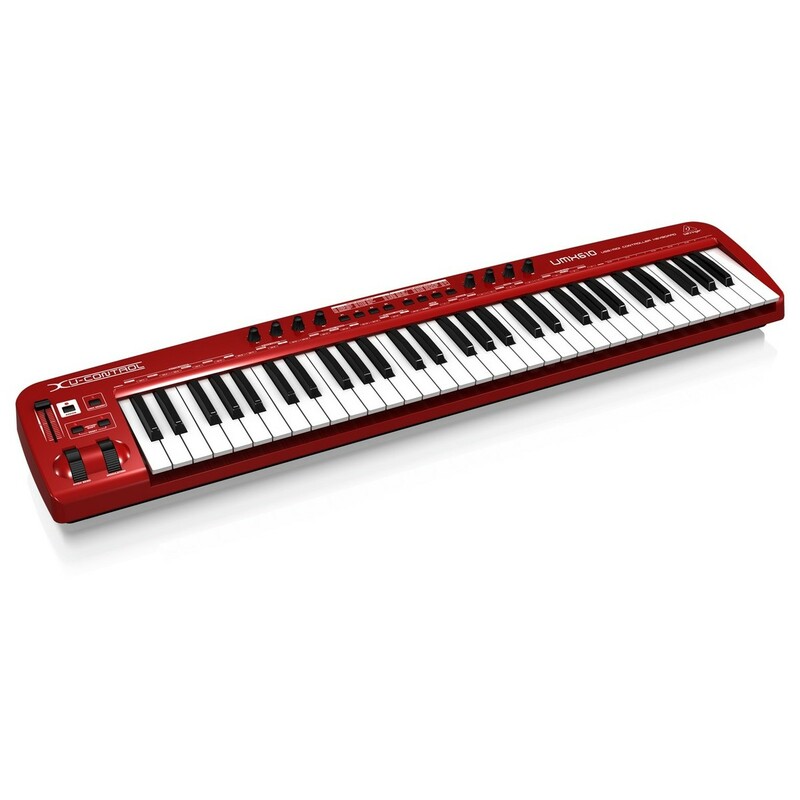 The 61-note keybed features up/down octave buttons that allow you to navigate between the full 128 tone range via the octave shift function with multi-purpose LED status indication. As well as the 61-Key Keyboard, the Behringer UMX610 also comes with a USB/Audio interface that allows you to record and playback a wide range of digital music files. The audio interface is the U-Control UCA222 by Behringer, with a simple in/out audio interface with dual RCA inputs and outputs. The interface features a USB connection allowing you to plug and play within minutes. This interface allows you to record and playback a range of digital audio and even includes an integrated headphone output. The low-latency output signal is ideal for recording and making music, as it allows you to play with minimal audio lag. The UCA222 also features an a S/PDIF optical output for direct digital conversion Additionally the interface features a volume control for added convenience, as well as an On/Off monitor switch and USB LED indicator. One of the most unique and eye-catching features of the keyboard is the prominent bright red finish. This rich, red finish not only looks good but makes the UMX610 stand out from the crowd. The design is simple and ergonomic, making it easy to use whatever your skill level. The 61-note velocity sensitive keybed features full sized keys, making the transition from analog pianos easier than ever before if you're a pianist. The modulation wheel is assignable for added versatility, allowing you to control a range of parameters from volume to automation. There are also 8 rotary knobs that can also be assigned to control a range of parameters and function within your DAW, allowing you to quickly customise the layout of your keyboard for convenience. Overall there is 22 assignable controllers for you to control everything from volume and pitch parameters to automation and virtual instrument controls.